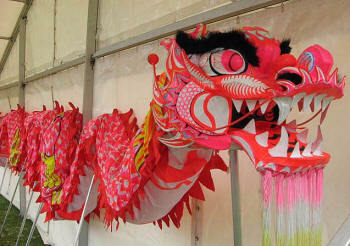 This is a simple craft to do for Chinese New Year or as a generic dragon craft. 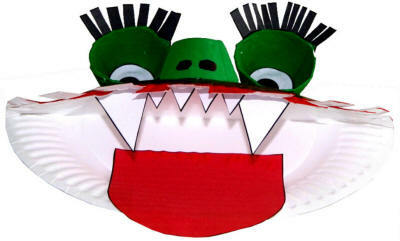 The fold in the paper plate allows the mouth to snap open and shut making this a fun puppet to play with. 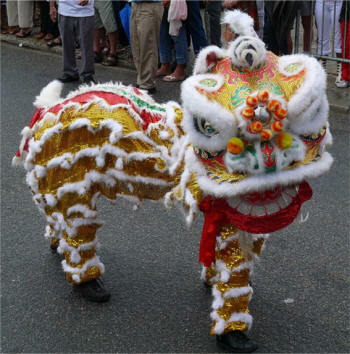 The Chinese Dragon Dance and the Chinese Lion Dance are both traditional dances that involve people dressing up in costumes to make full sized "puppets". Martial arts moves, bells and drums accompany the dances. 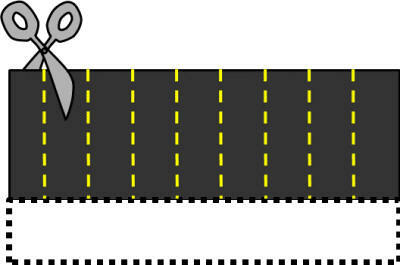 Sometimes people, including me, confuse the two because the lion looks a little dragon-y. When I finished this craft, I realized it looks a little bit more like the Chinese Lion Dance. Chinese Dragon Dance: The dragon is made by many performers. You can see the performers hanging onto the poles and moving the dragon. Chinese Lion Dance: The lion is made by two performers. They are entirely covered by the costume. optional: Hot Glue Gun (I did not use one, but if you have rowdy puppeteers you might want one). Fold your paper plate in half and crease quite firmly. The bottom of the paper plate (the part that sits on the table) should be facing out and the top of the paper plate (the part you put food on) should be the inside of the "mouth". Paint your paper plate in the desired colour(s). We painted ours gold with red around the edge. Acrylic paint dries fast and we can buy it for $1 per bottle at our neighbourhood dollar store (a pleasant walk from our house) which is why we like it. Just make sure you wear old clothes. It's washable WHILE WET, but once it dries it's permanent. "Washable" craft paint will also work for this project, but one warning... my experience is that the washable paint can stain some fabrics so please keep your work area someplace smart (kitchen table for us) not over your priceless antique dining room carpet... And please clean up any spills immediately with a paper towel or old rag. Paint the three egg carton cups another colour (we used green) inside and out. While your paint is drying, print out the template of choice or create your own template pieces. 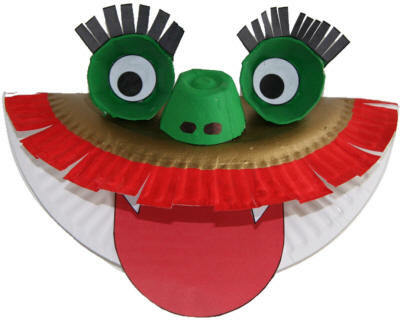 This craft has very simple template pieces, so feel free to provide an example for the kids and then let them cut out their own tongue, teeth, eyelashes and eyeballs from paper or construction paper. Colour the template pieces, as necessary and cut them out. Cut a fringe in the eyelashes. This is very important as it will allow the eyelashes to "wrap around" the egg carton cups. Once the paper plate is dry, cut a fringe around the outside. This isn't necessary, but I think it makes the puppet look nicer. Glue the eyeballs inside the two of the egg carton cups. Glue the egg carton cup that doesn't have an eyeball, cup down, onto the front center of the plate as a nose. We just used regular school glue and it worked fine. Glue the eyeball egg carton cups just behind the nose with the eyeballs facing forward. Fold the tab of the eyelashes and use it to glue the eyelash fringe around each eye. Fold the tab of the small row of teeth and use it to glue the teeth inside the mouth. Fold the tabs of the fangs and use them to glue one fang on each side of the teeth. Glue the tongue inside the mouth. We just put glue on the top edge of the tongue so it still flops around. Draw a couple of nostrils on the nose with a black marker or black paint. Set everything aside to dry really well. If working with younger children you can use this dry time as an opportunity to sneak in with a glue gun and strengthen the bonds of the egg carton cups. My daughter is 14 and not very rough with her projects so we just left it with the school glue and it didn't ever fall apart. If you're making this for some serious playtime, use a glue gun for all of the egg cartons. Close template window when done printing to return to this screen.